Established in 1993, The Therapeutic Clown Program at SickKids provides patients and families with therapeutic clown care, using spontaneous humour and gentle play to minimize stress during hospitalization and treatment. Working under the umbrella of the hospital’s Department of Child Life, therapeutic clowns collaborate closely with Child Life Specialists, and other members of the multi-professional team to develop therapeutic strategies within the model of family-centered care. Through the medium of clowning, the program offers caring playmates who provide opportunities for safe, inclusive play. The mandate is to minimize stress for patients and their families during hospitalization and treatment through gentle play, light-hearted humour and whole-hearted silliness. Therapeutic clowns humanize and normalize children’s experience in hospital by promoting what children do naturally – play. At SickKids we view play as an essential part of the child’s growth as it fosters imagination and creativity, and facilitates healing, coping, and mastery of skills. The program’s aims are to raise the standards of therapeutic clowning and to involve themselves in research efforts in order to bring about a clearer idea of the impact the clowns are having on the clients, their families, the staff and the very environment in which they serve. The Therapeutic Clown Program eases the stress and anxiety of hospitalization and treatment for seriously ill and injured children. Therapeutic clowns become caring playmates and provide comfort and emotional support at a time when children and families need it most. 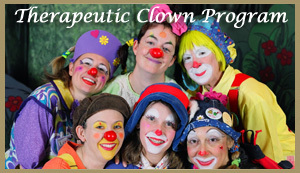 To read more about the Therapeutic Clown Program, or to become a volunteer, click here to visit their website.